Join our USA wildlife and wild west history tour for the experience of a lifetime, filled with the most exquisite wildlife Western America presents. Explore three of USA’s famous national parks including Yellowstone, Grand Teton and Badlands National Park as you make your way from Salt Lake City, Utah to Denver, Colorado. Go beyond the usual sights of group tours with our experienced guides, exploring famous sights and largely undiscovered natural scenic areas. 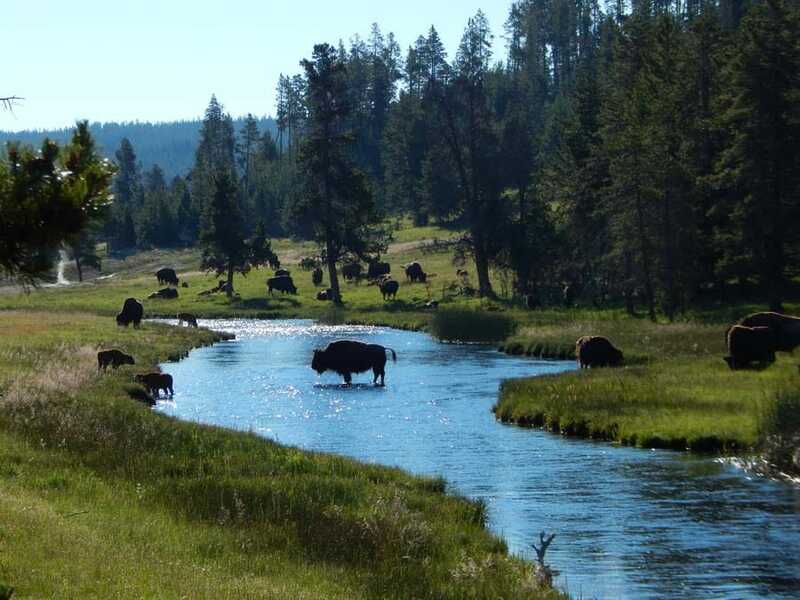 Immerse yourself in the USA wilderness where bison, deer, elk and the occasional bear still roam free. While on tour learn about the history of the American West across these memorable and culturally significant states. Our USA wildlife and wild west tour travels in a small bus with up to 12 participants, great for couples and singles. Discover Yellowstone National Park- where hot springs blast from the earth, flowing in bubbling rivers and geysers of every color. Amidst the volcanic activity resides the densest wildlife medley anywhere in America. Explore and hike Antelope Island, a heaven for water fowl, pronghorn antelope and wild bison. Throw yourself into the scenes of old Westerners as you stroll the streets of Jackson Hole or Cody, Wyoming, both small historical wild west towns. Spot ospreys, bald eagles and moose while on a boat ride and walk along a gorgeous alpine lake shoreline with unique views of the Grand Tetons. Track a wild mustang herd in a solitary prairie of Wyoming. Hike and picnic at Custer State Park home to wild burros and bison. 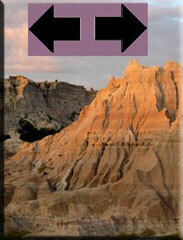 Explore fantastic natural areas at Badlands National Park and discover desert animals adapting to harsh conditions. Learn about mining and Native American history in the Black Hills of South Dakota. See amazing rock art at Crazy Horse Monument and Mount Rushmore. Visit two beautiful cities and state capitols of the west: Denver, capitol of Colorado, “the Queen City of the Plains” and Salt Lake City, capitol of Utah “The Crossroads of the West”. Custom tours for groups of 6 or more available all year. If you would like to reserve a spot on one of our tours, or would like to get more information, please contact us! Our small group bus tour is perfect for nature enthusiasts traveling alone or together with family/friends. 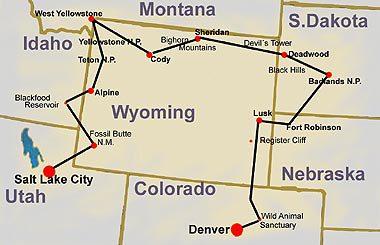 The interactive schedule will inform you with details about every location we visit in Utah, Wyoming, Montana, and South Dakota on our small group expedition. We describe the main attractions, as well as smaller features of particular interest which you may not have heard of. With information about parks, monuments and cities, you will know what to expect and prepare for on the tour. 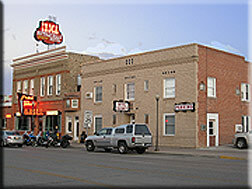 The Irma Hotel, a historical Buffalo Bill location including restaurant and saloon. Travel Dream West has carefully chosen hotels for their charm, uniqueness and great service. We stay in small communities where you will have a chance to get to know the locals. Our small group tour also features some special accommodations chosen for their originality and historical importance. The first night is spent in Salt Lake City, Utah. The last night is in Denver, Colorado, with daily connections to international airports. You can book additional nights, and we encourage you to arrive a day in advance to experience Salt Lake City’s downtown and attend the world famous Tabernacle choir performance. The image gallery features a page of photographs that illustrates some of the highlights of these small group wildlife tours. Images can also be found in our interactive schedule. Browse through these photos to get an idea of what you will see during your all American animals tour.